Disclaimer: I received this book from the publisher in return for my honest review. Lauraine Snelling is a prolific author. Previous to reading this book, I’d read only a couple other books in other series she’s written. She’s well-respected and loved in the Christian writing community. What I came to understand about this series is that it’s probably a continuation of other books about the people of Blessing, North Dakota, established by Norwegian immigrants in the late 1800s. If you’re not familiar with the Song of Blessing series, it’s going to be difficult, but not impossible to follow the story. Enough information about past goings on is given succinctly. In case you have trouble following all the people, the author has conveniently provided a family tree of sorts at the beginning of the book. It’s a family tree of the town and of the families in that town. 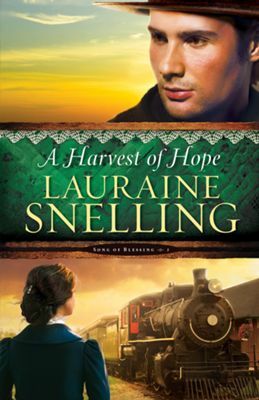 A Harvest of Hope is set in 1905. The only problem I have with the back cover copy is that the story seems to be of Trygve (I have no idea how to pronounce that name, so in my mind I called him Trigg or Trev, depending on my mood) Knutsen and Miriam Hastings. Nope, not exactly. It’s not a standard romance about two people, it’s about a town. As far as I know, Miriam Hastings was introduced as a new character in the first book, To Everything a Season. She is a nursing student from Chicago who is interning in Blessing. Trygve is a local boy. We already know he’s fallen for her, (having read the first book) but will she be able to get past certain family obstacles to fall in love with him? And their “romance” isn’t much of a romance. The book is mainly a series of everyday events, plus a few prejudices and a couple of main events. It’s how the people of Blessing deal with those everyday events and rely or not, on God to get them through. By the end of the book, Miriam has decided she can fall in love with Trygve. Will they get married? We’ll see. Hopefully that will take place in the third book, An Untamed Heart. I like series books that stand alone but are connected. Sagas make me quickly lose my patience. Their desire is to hook you so that you will buy all the books. And if you really love it, and are just now getting into the people of Blessing, you can purchase The Daughters of Blessing series or Home to Blessing series. I’m not going to. There were at least five points of view in this book. Yes, you had Miriam and Trygve, but you also had Ingaborg from earlier series, I’m presuming, Thorliff, her son, his wife Elizabeth, a pregnant doctor and Astrid, Ingaborg’s daughter, who is also a female doctor. There are too many points of view for me to care. Based on the loglines and the back cover copy, I thought the story was about Miriam and Trygve. I wanted to see a lot more of them than I did. I think there are multitudes of ways the author could have told this story, but she’s chosen saga form. I’m just not into it. I believe it’s just me. Another problem I had was the use of Norwegian. Most of the time, I understood what the words were. Most of the time, but not always. Maybe if I’d read all the other Blessing books, perhaps it would be old hat by this time. Much of the book is also taken up in grieving. Ingaborg is grieving the loss of her second husband, Haaken, who died at the end of To Everything a Season. Miriam is grieving the loss of her mother, and separation from her siblings in Chicago. Luckily for her, she has a brother and two sisters who are old enough to not only take care of themselves, but their younger sister as well, so they didn’t have to go to an orphanage. It is expected that Miriam will work in a Chicago hospital upon completion of her internship in Blessing. Will she choose to stay there, or move her siblings to Blessing so she can marry Trygve? I rate this book three stars, only because I had to work hard at learning the characters, their purposes, and their place in the series. I still can’t say I know all the relationships. I would have had to read the last who-knows-how-many books in order to get the full picture and history. It’s not a very happy book, because of the grief. Even though the grievers respond correctly, as much as they can, because of the emphasis on the day-to-day, almost like the Hallmark movie “The Magic of Ordinary Days,” I don’t know, maybe it’s just me, but I would like to have had a simpler story and more focus on the lovebirds, and less on the other characters.